You don't need a sauna to enjoy this special soap, inspired by the Finnish purification tradition of Northern Michigan. 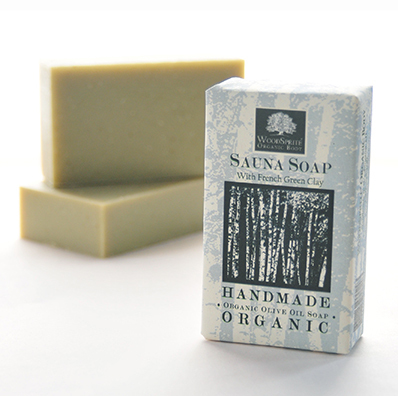 This beautiful soap features French Green Clay and is scented with pure essential oils of soothing sassafras, enveloped by stimulating sweet birch and the grounding aroma of cedarwood and fresh juniper throughout, encouraging opening of the breathing passages and the pores, purifying and cleansing while bringing the refreshment of the North Woods to you. Absolutely No Artificial Colors, Fragrances or Preservatives. Not Tested on Animals. Cruelty-Free. Ingredients: Saponified oils of *Organic Extra Virgin Olive, *Organic Coconut, *Organic Sustainable Palm, & *Organic Sunflower; Pure Essential Oils of Sweet Birch, Cedarwood, Juniper Berry, Balsam Fir, *Organic Eucalyptus, *Organic Lemon, Red Cedar, *Organic Grapefruit, *Organic Lavender, Allspice, *Organic Peppermint and Clove; French Green Clay, *Organic Wheatgrass. (*Certified Organic) 100% Natural. All Skin Types. 4 oz. net wt. Hand-wrapped in 100% Post-Consumer Recycled Paper.